High Quality Content by WIKIPEDIA articles! 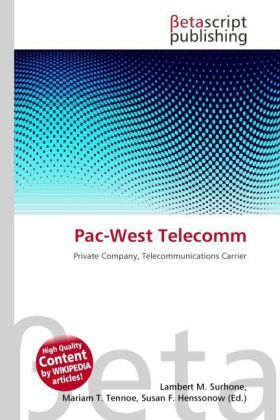 Pac-West Telecomm, Inc. is a privately owned wholesale telecommunications carrier headquartered in Oakland, California, United States. Founded in 1981, the company is one of the few wholesale-focused competitive local exchange carriers (CLEC) in the United States and provides services to twenty-five states, with service areas on the West coast, Texas, and in the Northeast.